There is quite a new article on the NewYorkTimes food section that more and more chefs change their minds about the use of freezers to preserve food. 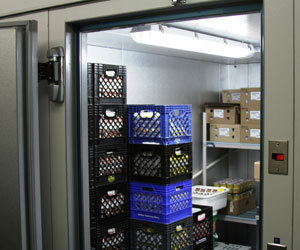 I believe, that it isn't really a secret, that freezers weren't ever forgotten in luxury hotels. The operations in a hotel, is just widely different than the operation in freestanding restaurants. Guests don't care about seasonality - if they pay a couple of thousand of dollars for their room! But what's about the role of the freezer in the bar? At a big extend, the sentiments of hotel restaurants and especially In-Room-Dining applies also to bars. While you have a higher ratio of outside guests, people still insist on things you might not carry on your menu. But not only you can keep produce in your freezer, to keep it from decaying in only few days - you can also improve your technique and quality for some drinks. I am sure, that you have pretty often a frozen drink, which lacked taste - or one which was just far too sweet. To make a frozen drink in a blender, usually needs a lot of ice, which doesn't only have to counterbalance the temperature of the cocktail ingredients, but also need to counterbalance the (hopefully homemade) purees or fruits you are using. If you freeze your fruits [or purees], you can replace the normal ice (which is water) with fruit, without sacrificing the texture. Further if you are living in an area, without local fruit production, it is beneficial to buy whole frozen fruits [like berries]; this produce is harvested in season on the peak of its ripeness - hence it will be better, than using fresh fruits, which are harvested unripe and ripe on the long journey to your destination. If you are living in an area growing fresh fruit, you can still offset the seasonality - and freeze produce in its season and use it in the winter. But frozen drinks are not the only thing, which benefits of the use of a freezer. Obviously you would need to thaw fruits, when you are using them in normal drinks, but this can also work in a quick blend in other drinks ingredients with the total absence of ice. You then can shake (...) your drink without any further problems. This is the traditional use of a freezer - however we have far more application in the modern bar for it. If you are aware how to make clear ice cubes (without getting ripped of by suppliers of the same), I don't really need to say anything further. For those who have no clue about how it works, here the short story: Add your water into an insulated container with a lid without insulation. Freeze. Get some further information from Camper English. You can get many more posts, if you google it. Another interesting application. You can concentrate juices [freeze the juice completely, defrost it on a colander - the substances which defrost sooner are the sugars, acids, etc. Most water stays frozen until later]. You can clarify with gelatine [you dissolve gelatine in a warm liquid and freeze it then - after that you again defrost it on a colander (this time in a fridge), the impurities with the gelatine will stay in the rest of the ice] - but truth to be told, you can easier clarify at fridge temperatures with agar-agar [but gelatine is easier to get hold to]. You can even "freeze distill" fermented beverages like beer or cider - it is the same method like above - but be aware, that the chances are high, that this method isn't legal in your country - and if you are overdoing it, you can end up with toxic levels of methanol in your beverage! For this, you have to have an understanding of the product you are freezing. Not everything freezes well [think about cucumbers - they taste "washed out" when frozen]. But a lot of products just don't change, when they are frozen. I am a big advocate for house-crafted ingredients. But sometimes it can be difficult within the operation. Freezing stuff, makes it a bit easier, because you can schedule accordingly and make, when business levels are low, your mis en place and freeze it until business levels are high, and you might be too busy to make it consistently.